London Theatre Voucher offer you the chance to give the wonderful gift of theatre to friends, loved ones or colleagues all year round! No occasion is too small (or too big!) to give someone special London Theatre Vouchers. London Theatre Vouchers can be exchanged for tickets to London’s top plays and musicals and can be combined with a visit to a choice of over 40 restaurants or a night in one of central London’s great hotels. London Theatre Gift Vouchers offers fantastic variety on shows and packages all year round, making shopping for gifts easy and enjoyable! 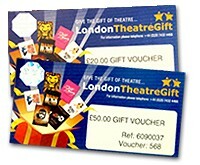 London Theatre Gift Vouchers – A Great Present! Notes - Vouchers may be shipped by an external supplier.